Sign up here and receive a unique discount code good for $210 off our week-long trips and $75 off our weekend Shabbaton trips. Code is good for 2013 trips. At Greener Travel we believe in giving you your money's worth - and then some. That is why we decided early on to package our little piece of paradise in an 8-day long trip that offers a diversity of memorable experiences and adventures. Traveling in small groups lets us give you personal attention, leaving you to enjoy an amazing trip without having to worry about the planing, as well as to share the experiences and meet new friends at the same time. Our tours are designed for attendees in the age range of 23-45. Our trips feature a diversity of experiences and adventures, offering a mosaic for all your senses. In the Caribbean highlands, our guests stay at Finca Rio Perla, a serene Jewish owned eco-farm near the slopes of the magnificent Turrialba Volcano that offers horseback riding, amazing jungle and waterfalls hikes and a glimpse at a real working Tico farm, as well as easy access to some amazing whitewater rafting! 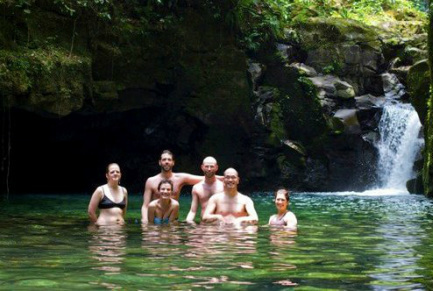 Our attendees also visit the white sandy beaches of the Caribbean coast where they can visit the Tortuguero and Cahuita National Parks as well as the biologically diverse Gandoca Manzanillo Wildlife Refuge, experience the native cultures of the Bribrí and Cabecar and go on a zipline adventure high in the jungle canopy - later chilling in the the colorful town of Puerto Viejo – one of the most happening places in Costa Rica – a place where surfers, backpackers and the counter-culture crowd blend with the local Latino, Afro-Caribbean and indigenous cultures. The group often spends its first Shabbat with the local Jewish Community in San Jose, sampling a bit of the color this city has to offer. You might want to check out some of the reviews from the people that traveled with us. We are constantly updating our group tours, building on the feedback we have been receiving from our satisfied customers. Please check out the group trips we are currently offering. If you are interested in a group tour but cannot travel with us right now, contact us and let us know - and we will notify you when we announce new group tours. You can also join our facebook fanpage, where we will announce future trips.